It's been a couple weeks since I posted updates on certification classes. 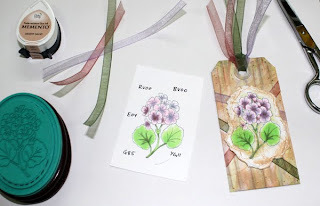 We had some great classes over the weekend and I want to thank everyone for attending. The following classes are open and applications have been mailed out. 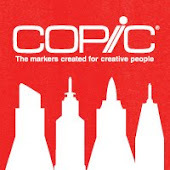 If you did not get an application, please send an e-mail to nancy@copicmarker.com We look forward to seeing you at a future class! Those of you who have been eagerly waiting for a certification in Australia need to wait no more. 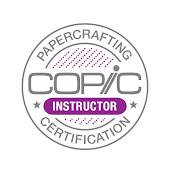 We are finalizing the details for two certification classes in Australia in May in conjunction with the Australian Copic distributor, XPress Graphic Supplies. Lori Craig and I will be teaching classes and meeting everyone, so clear your calendar and join us! For those of you in Australia attending the SIA show (the Australian equivalent to CHA), Lori and I look forward to meeting you in the X Press Graphic Supplies / Copic booth on May 5th. Note: This is a wholesale only show, however, the class on the 6th and 8th will be open to more people. Sydney, Australia, May 6th, 2010 Taught by Marianne Walker and Lori Craig. Melbourne, Australia, May 8th, 2010 Taught by Marianne Walker and Lori Craig. 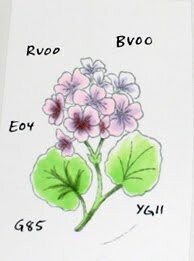 Please send an e-mail to nancy@copicmarker.com to get on the Australian mailing list. As soon as final details are arranged X Press Graphics will contact you with class information and payment options. Get your e-mail in quickly so you can reserve your spot! We look forward to meeting everyone and having some exciting classes. Don't miss this rare opportunity- tell your friends, and we look forward to coloring with you! 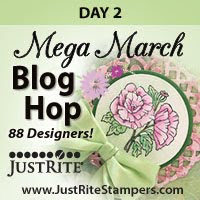 Tomorrow I will show a fun tag I made for the Just Rite Stampers blog hop, so stay tuned! Applications have been sent out for the following locations. 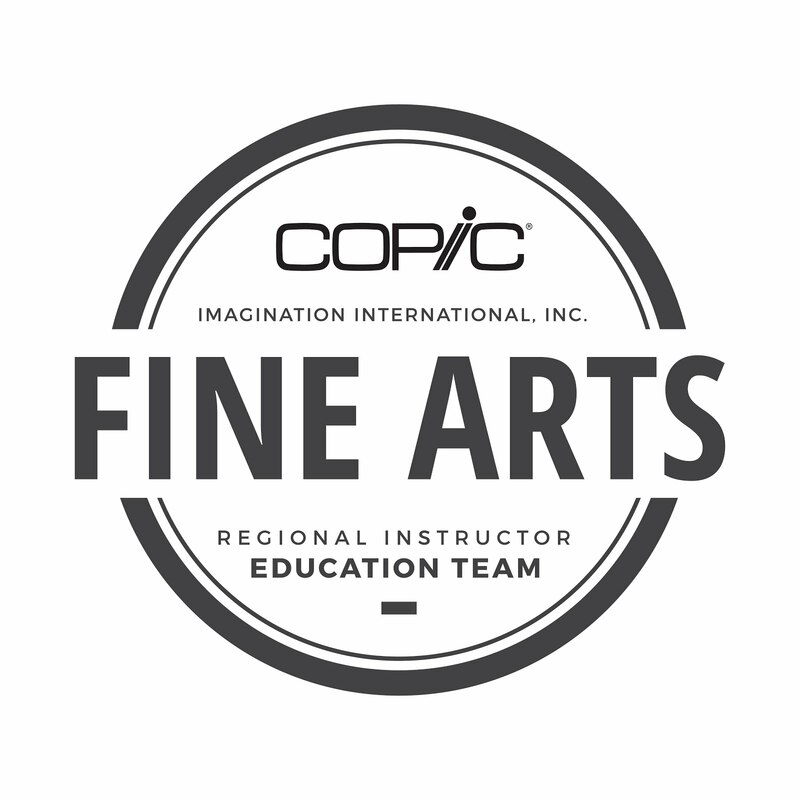 If you need an application for one of these cities, please send an e-mail to nancy@copicmarker.com Even if you are not eligible at first for a class, please submit your application. Waiting lists fill quickly, and are filled in a first come, first serve basis. April 19th, Phoenix AZ Taught By Jennie Black, assisted by Marianne, Filling Fast. We will not open a second session at this time, we will come back in a few months and offer another class. I wanted to share a recent illustration project with you so you can see part of my process. 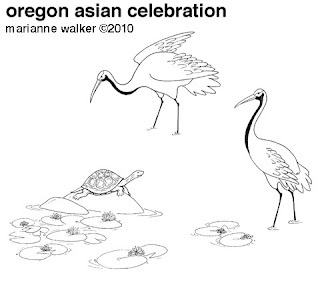 This was a poster I designed for the Oregon Asian Celebration which is held each year in February. This year I was out of town so I could not attend the event, but I still wanted to share what I made for it. For the last 5 years I have designed their posters and each year I use Copic in some aspect. (You can see last-year's poster design notes here). This year I made my illustration more digitally than in years past, but I still want to show you how I started with Copics. For this first picture you see, I drew the pagoda in the background, and scanned it in. I showed it to the client and they loved the image, then they told me what else they wanted to see in the picture. Their theme this year was "Reflections on 25 years" as it was their 25th anniversary of the event. 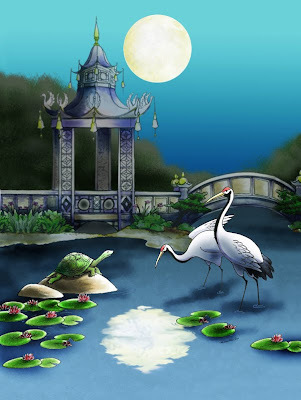 They wanted the moon reflecting in the water along with a turtle on a rock, some cranes, and other symbolic images. 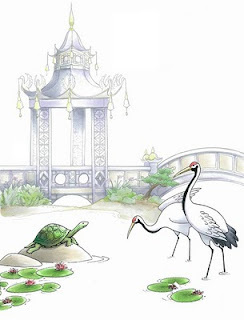 So I drew the turtle and cranes as separate images and scanned them in. Using Photoshop I arranged them how I wanted them to look and made the pagoda gray instead of black, so the cranes and turtle would stand out more. I printed these onto color laser copier paper and colored them in very lightly. This image looks great, but I knew the final picture was to be at night. By getting my basic shading in at this point I knew that I could always darken it on the computer. I also left the water and sky uncolored, as I was not sure how much shading or light I wanted to do, so I left it as areas to color on the computer. Here is the final computer colored version. You can still see hints of my basic coloring. By using Photoshop I was able to darken the whole image, add in my water and background without worrying about making mistakes, and pull the whole thing together. As you can see, I use both the markers and the computer when I need to. Neither one is better, as they are both tools and I use each one for it's strengths. I hope this gives you some ideas. Have a great weekend! I'll have updates on certifications tomorrow. Time for a quick update on Certification classes. We have some great events coming up in the next couple months, so plan ahead and attend a class, or retake a class to get the new manual*. If you have hesitated over taking a certification class, there has never been a better time than right now! • Coupons: This year, each store that attends a certification class get a page of coupons from many different manufacturers. These are good for wholesale orders only, and you can easily make back the cost of the class by taking advantage of these special deals. Valid ONLY for stores who take a Certification class. • New Manuals: Even if you have taken the class before you may consider retaking the class. Retaking only costs $40, and you'll get a new manual to help you remember everything you forgot. • New Instructors: It helps to take the class from a different instructor the second time, so you can see techniques in new ways. Each teacher brings their own flair and strengths to the program, so come a second time and ask all the questions you wish you could have asked the first time. April 19th, Phoenix AZ Taught By Jennie Black, assisted by Marianne, Almost Full! Note- if this session fills we will add a second class on April 20th. *The new manual is still at the editors, so please be patient! We are printing only as many as we need for each class right now, so if you can't wait any longer, just retake a local class and you can get the manual now, rather than waiting for the final, wire-bound manual that we will eventually have back.